Russian Energy Minister Alexander Novak speaks during a news conference of the 4th OPEC-Non-OPEC Ministerial Monitoring Committee in St. Petersburg, Russia, July 24, 2017. MOSCOW - Russia will increase its oil output by 3.5-4.0 million tonnes in 2018 if a global deal between OPEC and non-OPEC producers to reduce production is not extended, Energy Minister Alexander Novak said on Wednesday. “We forecast that in 2018 we will have small growth relative to the year 2017, but it will to a large extent depend on what decisions are taken on extending or not extending the (output cut deal) with OPEC nations,” Novak told reporters. “We will now make our forecasts within a range of a possible (output) increase from today’s level, if there is no (extended) deal (with OPEC),” he said. Russia’s oil output is officially forecast at 547 million tonnes this year and next. Russia will increase its oil output by 3.5-4.0 million tonnes in 2018 if a global deal between OPEC and non-OPEC producers to reduce production is not extended, Energy Minister Alexander Novak said on Wednesday. 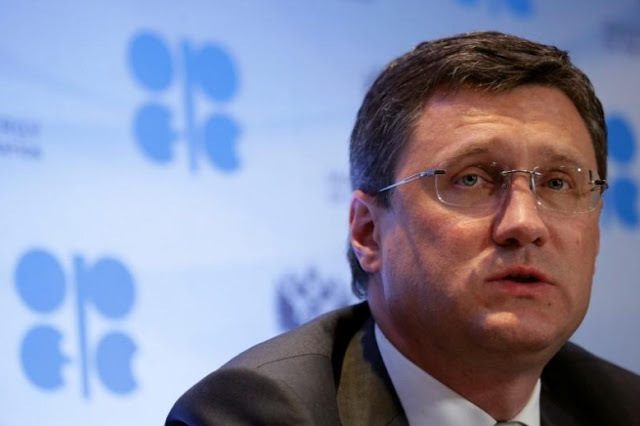 “We forecast that in 2018 we will have small growth relative to the year 2017, but it will to a large extent depend on what decisions are taken on extending or not extending the (output cut deal) with OPEC nations,” Novak told reporters.